Full list. 353 DVD threshold, 297 BD. 286 33,586 28 Love Live! μ's 3rd Anniversary LoveLive! Pretty decent wk2 followup for Nogenora. Weak new spring v1s this week. Black Bullet v1 sells 2269/642, total 2,911. Kawaisou v1 sells 2088/552, total 2,640. Dragonar v1 sells 919 BDs, DVDs do not rank. Love Live s2 adds 5813, total 103,400. Gochiusa v1 adds 650 BDs, total 10,732. Hoping for at least one more week to put it over 11k. Mekakushi v1 adds 799/808, total 10,660 in wk2. Once again this is like, the absolute hardest show to talk about. Calling 10k a disappointment for the first adaptation of a franchise just sounds absurd under almost any normal circumstance. 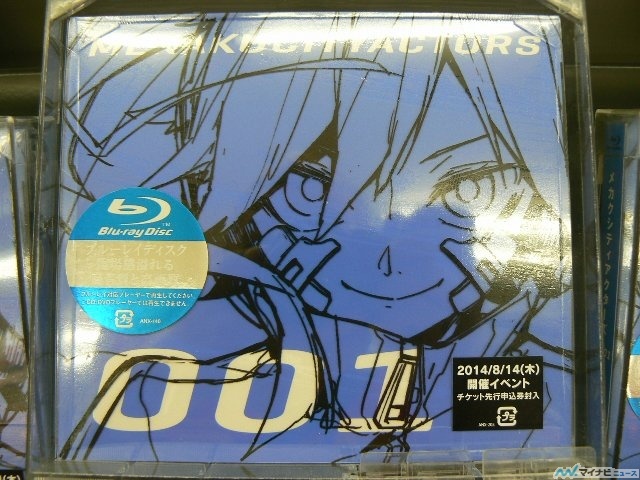 But this was marketed like a CD single (it’s even literally packaged as one) at least as much as an anime BD. And Jin singles/albums usually sell far, far, far more than 10k. I mean, he’s the P who put out the all-time best selling Vocaloid album, beating out Supercell. So if the anime had been well received this could have sold so much more. I just don’t know what to think about the whole Mekakushi project anymore. I guess nothing more can be said until we’re about 6 volumes in, and see if it’s still topping 10k or dwindling fast. Nogenora v1 adds 1094 BDs, total 9,531. Kamiasobi v1 adds 588 DVDs, total 7,233. Date A Live II v1 adds 741 BDs, total 6,304. Still 1k below the lowest-selling s1 disc, though depending on how it does from here on the drop might not be too bad. Puchimas!! v2 adds 360 BDs, total 3,249. Nourin v4 sells 1678/353, total 2,031. Z/X v4 sells 402/387, total 789. Nisekoi v4 adds 492 BDs, total 5,558. WUG v4 adds 359, total 2,204. Kyoukai v7 sells 2975/929, total 3,904. Up about 17% on v6wk1 for the OVA. Series average: 4,286. Monogatari v9 adds 2055/458, total 36,516. Kurobas s2 v6 adds 422/502, total 18,861. 3.9% ahead of v5 after the same number of weeks. LitBus v6 adds 708 BDs, total 8,489. This should end around a 9.2-9.3k average, only 1k below s1. Kill La Kill v7 adds 7185/1229, total 8,414. Nagiasu v7 adds 301 BDs, total 3,531. T&B Rising sells 23533/1083 BDs, 6736/1011 DVDs, total 32,363. Madoka Hangyaku adds 297 LE BDs, total 181,510 in wk14, meaning it added 307 in wk13. Persona 3 #1 adds 375 LE BDs, total 38,752. 2014/07/09	Hoozuki no Reitetsu v5 A ver. 2014/07/09	Hoozuki no Reitetsu v5 B ver. BB sold less than 3k. I really wanted to see more Enju in the future. Love Live is finally dying out, maybe it’ll stop ranking in the next two months or so. Waiting until the full list is out to make commentary? Not sure what you mean, I think it’s all there. Did I miss anything (that I’d normally include)? I think he was talking about your comments on the v1s, maybe? Although sales wise, nothing really interesting. Kawaisou/BB sold average/below average and that dragon harem show did not rank in the pre-elim list. I wish Japan would space out its releases more, slow weeks are rather boring. Yeah, that was all. I guess it was a slower boring week so there’s not much to say. Maybe also something about the final Kyokai volume but eh whatever. Ah, yeah “x sells #/#, total #” tends to be the standard, anything else is just added on a whim if I see something that’s interesting to me. This was a pretty boring week so I didn’t really have a lot to say. Kyoukai has been consistent since v2, and the OVA boost was only modest. Final sales were about as expected. It ended up being decidedly unremarkable sales-wise. Not that bad, not that good, just kinda “average”. I also do the Tuesday postings at 4AM (ugh time zones) after about 3 hours of sleep, so sometimes I’m barely conscious and just want to get it done and get back to sleep for a little bit before work, heh. I must confess I don’t understand what T&B has to do at this point to get a second season. I enjoyed The Rising very much, but it’s a series much better suited for TV. I’m amazed it’s had the longevity it has, honestly, and I think Sunrise is a little crazy for not jumping on it. Yeah between demolishing anyone’s TV disc sales expectations, then the two movies combining for over ¥1.1bn, and at least okay movie disc sales (which will presumably be higher for the second movie), there’s not a whole lot more it could do to change their minds. See Horizon which consistently sold 20k BDs despite having less than 50k people reading light novel. The ratio of disc buyers, consistency, dedication is insanely high yet Sunrise refuses to announce S3. Horizon is doomed, Studio 8 has become a money factory thanks to that silly idol show and I doubt Horizon is even on their radar anymore. Horizon was done by the same studio as LL? Ouch. Yeah, I imagine they’ll be riding that gravy train for quite a while yet, leaving Horizon behind in the dust. At least Studio 6 doesn’t have anything big right now aside from, well, T&B. At least I can use the still-running novels to feed my false hope there. The IxB SS manga is over and the franchise has three limbs in the coffin thanks to the same problem of the studio in question riding off into the sunset on a bigger cash cow (not that I mind Jojo, but it shouldn’t be a choice between two franchises that popular). How I wish there was more of Inu x Boku SS! I didn’t expect much from this show at first but it’s just so special with equal male-female cast (both numbers- and quality-wise), actually well developed relationship between main pair, solid characters overall, unique setting, decent amounts of humor and subtle yet exciting fanservice, abundance of great EDs over a single cour and good art… We need more shows like this one. True, at least it’s hard to run out of things to read with Horizon being triple the volume of normal LNs and its similar in size prequel. The best selling Vocaloid album for a long time was Supercell’s debut album, also titled Supercell. It last ranked April 2012 and had sold 108,766. Jin passed Supercell maybe half a year ago with Mekaku City Days, which as of this week has ranked once again and is up to 123,828. Mekaku City Records, released later, has done even better and hit 153,676 this week. I used to track Vocaloid sales just like I do anime sales, but then the blog that compiled all the information shut down. Technically I could get the info from my Oricon account but that would require keeping track of every Vocaloid release and searching through the very poorly formatted Oricon data to aggregate it all, and it was just way too much work. =/ I really wish some other source had picked up the slack. Updated for the full ranking. Ranking summary and all that tonight. >Kyoukai v7 sells 2975/929, total 3,904. Up about 17% on v6wk1 for the OVA. Series average: 4,286. Anyway, it seems that, as expected, FrES is going to sell very well. KyoAni should get better screenwriters considering Jukki Hanada is becoming a thorn to their skills. God, I hope Amagi is entertainingly good and sells really well. I’m also curious about that light novel KyoAni actually gave first place to which I’d imagine will be adapted in the future. I’m glad that it looks like No Game, No Life (I insist on putting a comma) is selling well, I started watching it yesterday and was pleasantly surprised, it didn’t look like it would be good, but now I’m hoping for a 2nd season, which hopefully will be imminent with those numbers. It had one of the biggest novel boosts in LN adaptation history relative to pre-anime sales, and the anime looks like it could average at least 7k. If it doesn’t get a sequel I riot. One the biggest? Is it not the biggest, I thought it had surpassed IS. I don’t really follow manga/LN sales though. Me neither, so I didn’t want to answer in absolutes. I just know it’s ludicrously large for a novel boost. Those are the biggest boosts in 2-week totals for LNs over the past 4 years. Depending on how long sales continue to rise (haven’t stopped yet! ), NGNL could end up undisputedly having the biggest boost, but it’s not quite there yet. I suppose I’ve mostly been paying attention to vol 1, which was last reported as sub-10k before the anime aired, and something like 15k if you add in the missing data, I guess? Maybe 20. I think some people on MAL news club have some data on it. I remember it roughly went from 7k to 135k. In other words, a 1900% increase? roughly? And that’s assuming that it sold zero copies in the interim. Its sales likely increased a bit over time as the series began to take hold as a 20k seller pre-anime (a really common pattern for young series). There are similar issues with other LN volumes. I’d guess it was coming from around 20-25k, at least. Definitely not a factor-of-20 increase. It’s really a shame that one of the best increasing series ever has some of the most inadequate, contradictory sales data pre-anime. I know the main problem it had was when it switched publishers/imprints/whatever, Oricon seemed to restart the sales. What a pain.